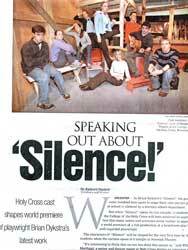 Based on a true story, Silence, is the story of a group of “at risk” high school students at a summer arts camp in Fargo, North Dakota. With their teachers they explored how their challenges, fears and hopes could be discussed in the form of drama. One young man was put in the program after trying to kill himself over his fear of his father’s reaction to his homosexuality. Although he never told his father he was gay, he wrote a play as a way of coming out to his parents. His father never saw the play because the administration canceled the performance deciding that the material was inappropriate. This the story of those kids and what they learned that summer about self-expression, censorship and growing up. Commissioned by the College of the Holy Cross. Production at Holy Cross. click to see production photos.